Most people have heard the story of the painter Giotto, who, when asked by the King of Naples for proof of his ability, drew a perfect circle as a fitting token of his artistic skill. In the medieval artist’s workshop neatness and accuracy were highly prized. Leonardo’s approach to drawing as exemplified in this compositional sketch is totally revolutionary. The figure-group is so enmeshed in a myriad of lines that it is virtually impossible to make out even the outlines of the figures. Having overlaid so many forms, one evolving from the other until no solution is immediately visible, Leonardo evolved a solution and traced it through with a stylus to the reverse of the sheet to produce a simple outline drawing. Leonardo noted that poets were quite prepared to cross out lines to improve their verse. He believed that the artist should be equally free to compose his images. In what is a very modern conception, the expression of the motions of the artist’s mind must have priority over neatness if the artist is to create great work. You who compose subject picture, do not articulate the individual parts of those pictures with determinate outlines, or else there will happen to you what usually happens to many different painters who want ever, even the slightest trace of charcoal to remain valid; this sort of person may well earn a fortune but no praise for his art, for it frequently happens that the creature represented fails to move its limbs in accordance with the movements of the mind…and these persons do not deserve the slightest praise in their art. The main study on this sheet is a preparatory compositional design for the cartoon of the Virgin and Child with St. Anne and St. John the Baptist, National Gallery, London. 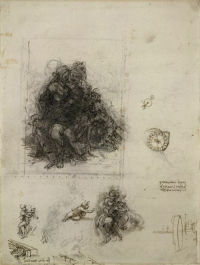 It is an extreme example of Leonardo’s “brainstorm” technique, wherein alternative solutions are overlaid in a single drawing until it becomes overworked to the point of illegibility. Black chalk has been overworked with pen and ink, followed by a grey wash and white heightening applied with a brush. A series of sharp incisions indicate that the design was transferred to the reverse side of the paper with a sharp stylus or metal point. Leonardo has added alternative ideas for the frame around the figure-group. The bordering lines, drawn with straightedge and compasses, are marked by series of equally spaced dots as an indication of the scale. The other studies, ranging from vague outlines of figures to a relatively well defined baby in pen and wash, deal with variations on the main composition and alternative ideas for various elements in a characteristically freehand manner. Other drawings on the sheet are related to Leonardo’s study of hydraulics, and include an overshot water-wheel and constructional techniques for dams.